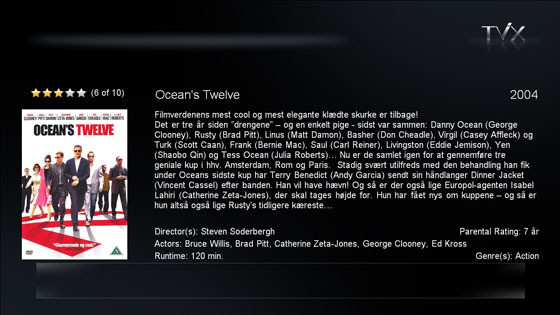 This feature is upcoming for My Movies for Windows Home Server version 1.50 and My Movies Server/Client 2.53. My Movies Client, Server/Client and My Movies for Windows Home Server stores movie meta-data for DVICO's TViX units (HD M-4100SH, HD M-5100SH, HD M-6500A, HD M-7000A and HD R-3300). This allows you to browse your videos with covert art, and see detailed meta-data such as movie covers, actors, descriptions and similar. This guide will focus on attaching the TViX to a Windows Home Server with My Movies for Windows Home Server installed, however the meta-data files for the TViX units will be stored also by the standard My Movies Client, and, the meta-data files will automatically be updated once you edit your titles using the Collection Management program in a My Movies Client. Notice that My Movies once TViX meta-data storage is enabled, will overwrite meta-data files stored by other programs, which means that you must be sure this is what you want before enabling the feature. 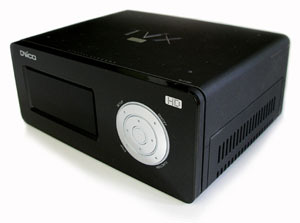 TViX can be configured with an internal harddrive. My Movies cannot connect to this drive, however if you enable monitoring on a folder where you keep the movie prior to uploading it to the TViX, you can get the meta-data files created this way for the internal harddrive. Of course changes to the meta data will not be updated on files kept on the TViX unit. In most situations, the preferred method is attaching the TViX directly to the Windows Home Server, where meta-data will always be updated. On My Movies for Windows Home Server, open the home server console, and select Settings and navigate to the "My Movies Monitor" area, and check the checkbox "Store meta-data for DViCO TViX units (TViX.jpg files)". On My Movies Server/Client or Client, open the Collection Management program, and from the menu select "Configure", "General Options", and select the "Folder monitoring" tab. Scroll down, and check the checkbox "Store meta-data for DViCO TViX units (TViX.jpg files)". In both places you will be asked to configure the TViX meta-data storage settings. The first setting to configure is the type of unit you have - this is important for the created files to match the unit. The it is recommanded to change the language the meta-data interface is created in. If you prefer a higher quality image on the TViX unit, you can increase the JPEG Quality value also. The folder JPEG size specifies the maximum size of the created folder.jpg image - a larger image makes the browsing on the TViX slower, while a smaller image may give a worse quality image display on other units depending on the folder.jpg file. Then please follow the below process on the TViX unit to connect the TViX to your Windows Home Server. In the main menu go to "Setup" or press the "Setup" button on the remote control while not playing a video. Server IP: The IP address of your server. ID + Password: A valid login for the movie folder share. Select the "Video" button in the main menu or via the remote control. Press Left Arrow on the remote to go to the Select Disk menu on the top of the screen. Select the new Network Disk and press OK.